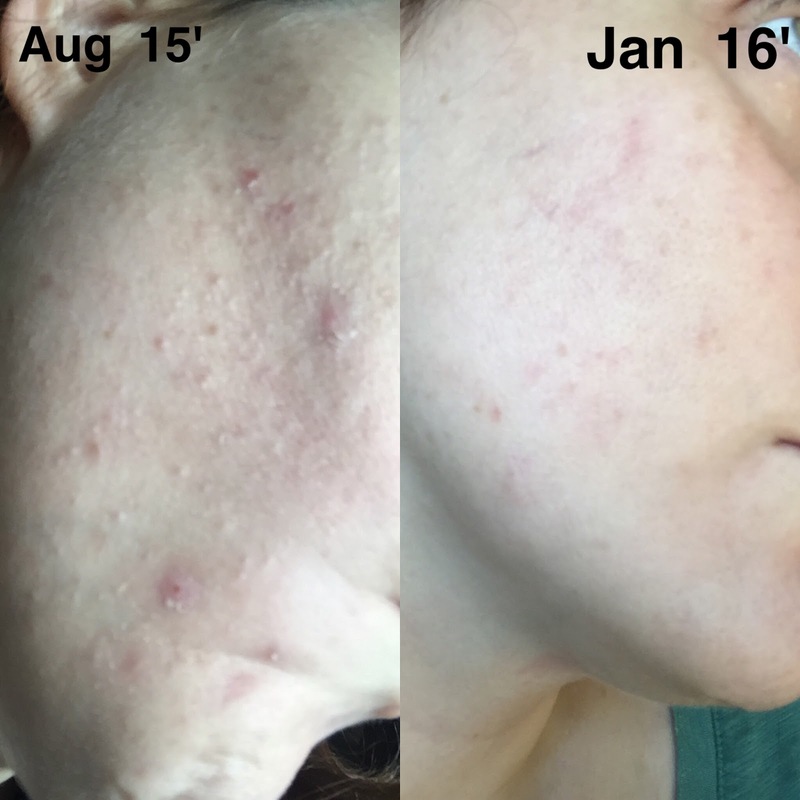 I wanted to take the opportunity to update my progress as I have battling hormonal acne for almost a year now. My skincare story began around March of 2015 when I noticed I was breaking out with acne more than usual. You can read my original post here! At first it was just a few spots here and there, but it quickly escalated and eventually I had breakouts everywhere. The worse part was I began to develop those deep cystic spots that hurt like hell. It was the first time in my life that I had ever experienced this type of acne. It was horrible....I felt disgusting, became depressed, I didn't want to leave the house. Here I was a medial Esthetician, with 17 years of experience and I had bad skin. I tried to treat it myself, but nothing seemed to work. In June, I finally went to see my primary care physician and she prescribed a few different treatments, some of which I was extremely allergic too. By August, without any improvement, my doctor prescribed Spironolactone, a medicine to treat acne in women. I am not one for taking a ton of medications but at this point I was beyond frustrated and completely desperate for a solution! I also decided to try Curology after reading so many positive reviews. You can learn more about Curology here! Medication: As noted, I am still taking 25mg of Spironolactone daily. I am also using my Curology prescription every night in my pm skincare routine. I am also on oral birth control pills. Lifestyle and Diet: What you put into your body really does make a huge difference in how you look and feel. Refined sugars, processed foods, caffeine, and other junk food do impact your health. I have never been one to eat a bunch of junk food, but I will say that I definitely have a sweet tooth. It has been difficult, but I slowly began to eliminate refined sugars and processed foods as much as possible from my diet. I put a limit on the amount of coffee I was drinking, incorporated more water and spearmint tea into my daily routine. I am still working toward getting more sleep at night, but with fibromyalgia, a good restful night's sleep is difficult. Mental Health: For those of you out there who know me personally, you know that I have a full plate and my share of troubles. I cannot talk about my experience with acne and not discuss mental health to some degree. I have fibromyalgia and because of this my mood is often a reflection of how I feel, most days are challenging. Depression will always be present in my life, but having positive and enjoyable outlets have made even the most challenging days bearable. Finding the Asian Beauty sub on Reddit has been absolutely amazing. I love being a part of such a wonderful community where we can all learn and support each other. I have also transitioned back to using Asian (mostly Korean) skincare products....you can read about that here! I cannot forget to mention my incredible fiancé who tells me everyday no matter what I may look like that I am beautiful. You are my rock and I love you so very much! Skincare: Finding the right skincare products have also contributed to my skincare success. As I mentioned above, I went back to using mostly Asian skincare products and have customized a morning and evening routine. As you can see, I have a collection of products ranging from treatment essences, ampoules, and creams to sheet masks and sleeping masks! The best advice I can give is to "listen" to your skin. Some days my skin is more dry so I use more hydrating products and so on. If you really want to do the best for your skin, you need to start "feeding" it properly. That's the best part about Asian skincare, you can customize your routine based on your skincare needs. Moving forward: I will continue to explore Asian beauty in 2016 because Asian beauty makes me happy :) My primary care doctor and I have decided to start weaning myself off of the Spironolactone over the next few months. I will continue with my Curology prescription and birth control, but by the summer, I hope to be off birth control (crossing fingers). My skin care resolution is to begin the process of fading the scars from this past year's acne episode. I will be on the hunt for products that brighten and fade scarring cause my PIH (Post-Inflammatory Hyperpigmentation). If you have any favorites please leave me a comment below.